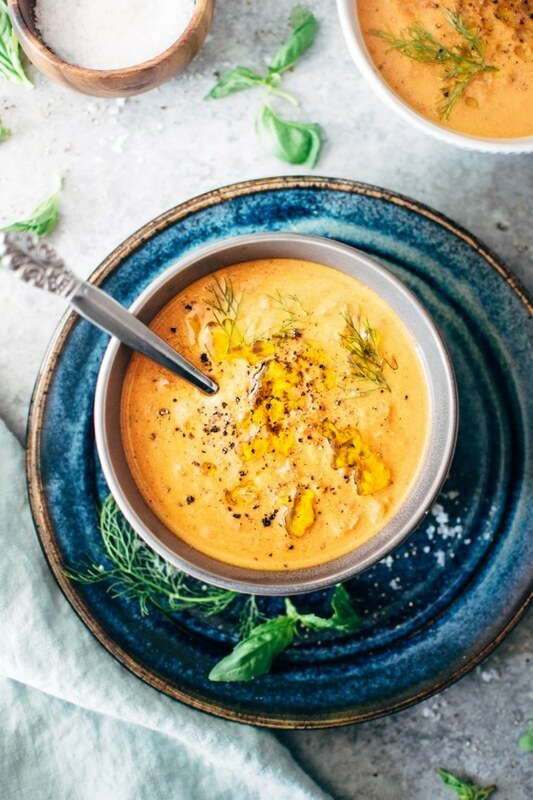 Creamy dairy free tomato and red pepper soup is naturally gluten and dairy free and bursting with summertime flavor. If there’s one soup that fits in this time of year, this tomato soup is it. Made with fresh tomatoes, sweet red peppers, lots of aromatics and soaked cashews for that ultra creamy vibe. A super healthy and comforting version of a summertime classic. Any other year round soup lovers out there?! This one’s for YOU! 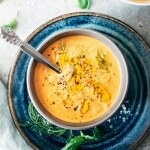 If there was ever a soup to make and love this time of year this creamy dairy free tomato and red pepper soup would be IT. Tomatoes just don’t get any sweeter than they are right now. And not only are they having an insanely delicious moment in the spotlight, they are also crazy affordable. The same goes for the red peppers. That’s the bonus of eating with the seasons ya’ll! Freaking delicious produce that doesn’t break the bank. Which means a little extra money in your wallet for that bottle of white wine or a fancy chocolate bar. 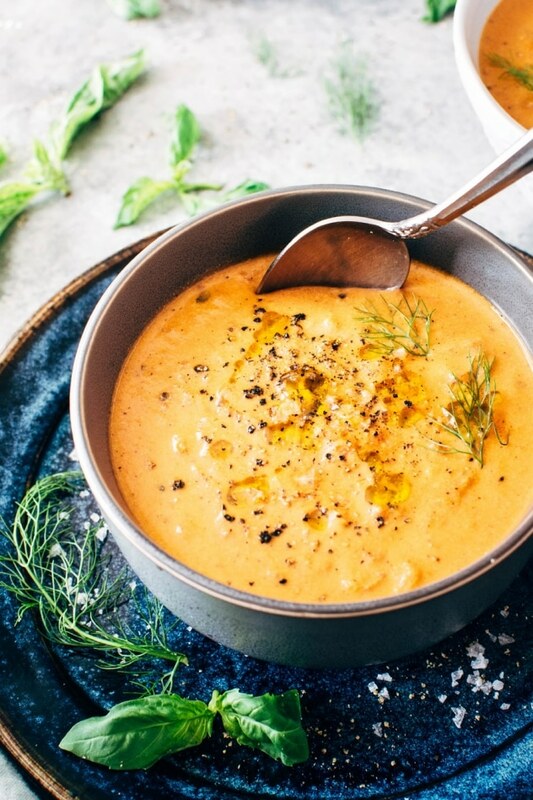 So, as we all probably know, creamy tomato soups (or any creamy soup for that matter) usually involve both dairy and gluten. BLEH! Not for me. The dairy and gluten can cause a rise of inflammation in the body and add distress to your digestive system. But this whole food tomato and red pepper tomato soup recipe has the exact opposite effect on the body. It’s made with fresh tomatoes and peppers that are packed with vitamins, minerals, and fiber. 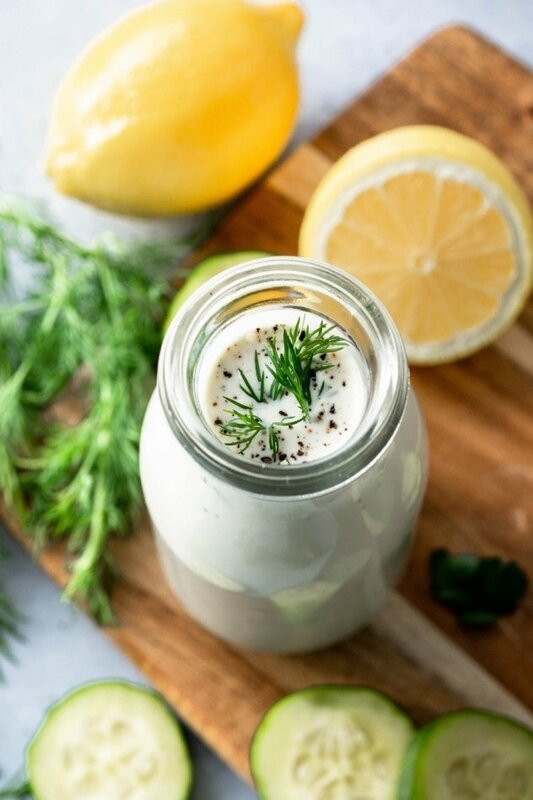 Plus the aromatics that add another dose of good-for-you nutrients, bone broth to boost your immunity and gut health, and cashews for some heart healthy fats, and more vitamins and minerals – including a particularly substantial dose of magnesium that can help manage your bodies intake of calcium and support nerve and muscle function! 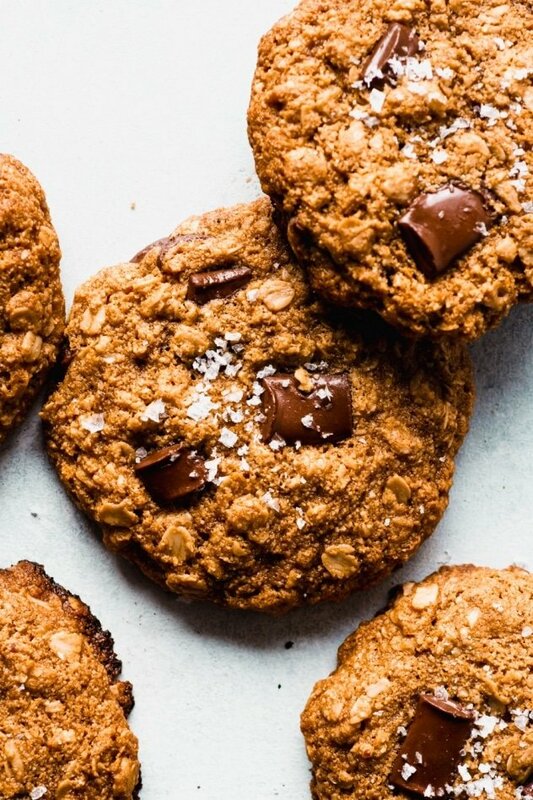 I know I use cashews a lot in my non dairy recipes, but stay with me on this one! They are by faaaar my favorite nutrient dense substitute for dairy. 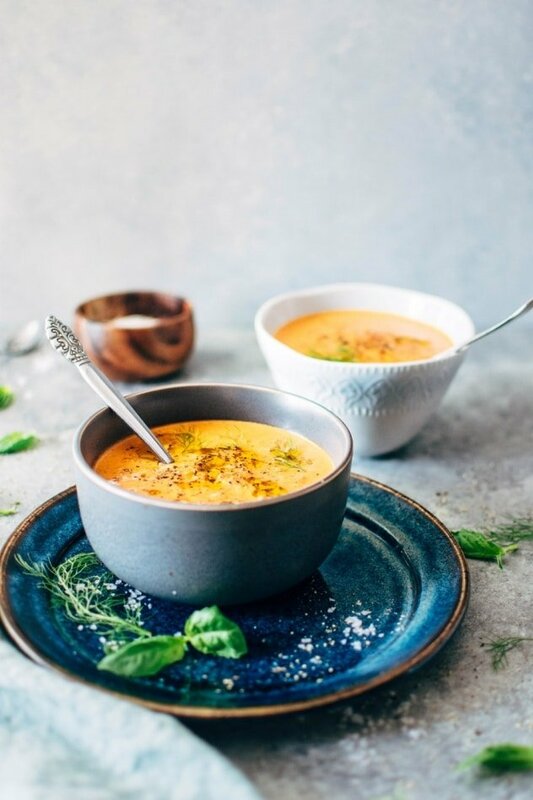 When blended, their neutral flavor and extremely smooth texture make them a match made in HEAVEN for creamy soups, sauces, and even some desserts. So good you would have no idea that this soup was dairy free if you hadn’t made it yourself. This particular soup recipe skips the step of making actual cashew cream, and instead blends the soaked cashews right into some of the soup for a more robust flavor, but if you want to experiment with cashew cream in other recipes I have a easy tutorial on how to make the stuff on it’s own HERE. With the help of your vitamix or high speed blender this soup literally could not be easier to make from scratch. The only prep you need to remember to do in advance is to soak your cashews. One hour in boiling water is sufficient if you’re short on time, or if you remember / have the time you could also soak them overnight in cold water. Basically just long enough so that they turn soft and plump up. To make the soup you’ll start by sautéing some aromatics like onions, garlic and fennel in plenty of olive oil. Once those start to caramelize and make your kitchen smell UH-MAZING, you’ll add the fresh tomatoes, cook ’em just until they start to burst, and then add the canned tomatoes (canned tomatoes add a little more texture and concentrated tomato flavor to the soup), sweet red peppers, dried herbs and broth of choice. Everything will just simmer away for about 20 minutes while you pour yourself a glass of wine and make a big green salad (sounds about right, yeah?). 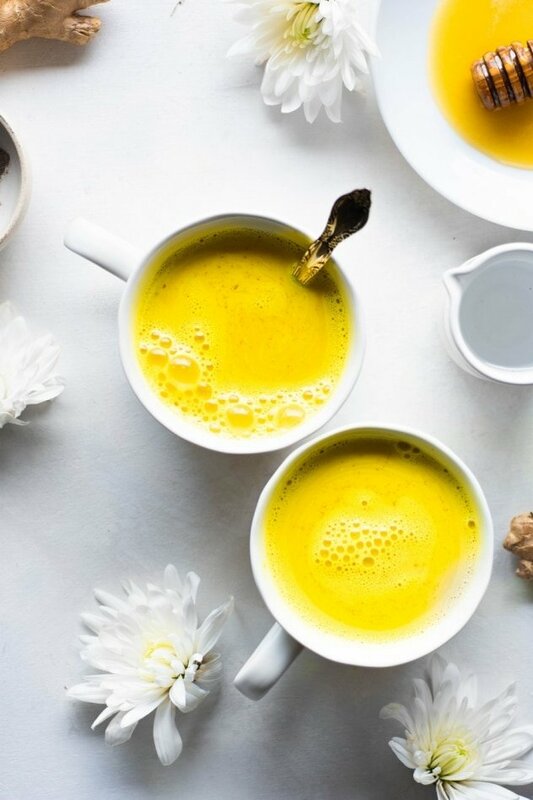 Once the veggies are soft, you’ll add about half of the soup to your vitamix with the soaked and drained cashews and blend it up until smooth and oh-so-creamy. 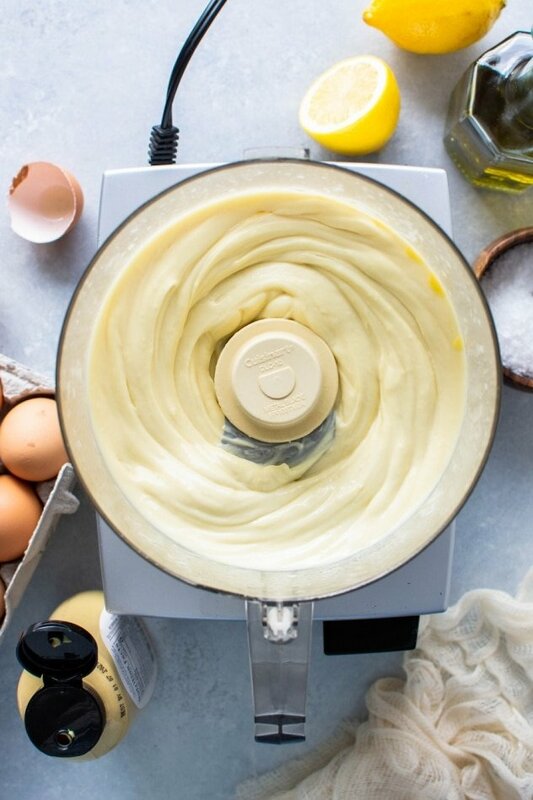 Transfer the cashew blended soup to a separate pot or bowl so you can free up your blender and pulse the remaining soup to your desired consistency. For a really smooth soup, blend the second batch until completely smooth, or if you’re like me and you want a little texture, just pulse it a few times. Creamy dairy free tomato and red pepper soup is naturally gluten and dairy free and bursting with summertime flavor. If there’s one soup that fits in this time of year, this tomato soup is it. Made with fresh tomatoes, sweet red pepper, lots of aromatics and soaked cashews for that ultra creamy vibe. A super healthy and comforting version of a summertime classic. Pour boiling water over 1 cup cashews – enough to cover them by an inch – they will expand a little as they soak. Set aside. Alternatively, you can soak the cashews in cold water the night before. Heat 2 tablespoons olive oil in a large soup pot over medium heat. Add onions, red pepper, fennel and garlic along with a big pinch of sea salt. Cook for about 10 minutes, stirring frequently, until veggies are soft and starting to caramelize. If veggies start to seem dry and the bottom of the pan is browning, add a little splash of water (just a tablespoon or so) and a small glug of olive oil and continue to cook. Once veggies are soft and caramelized add fresh cherry tomatoes with dried spices and cook until tomatoes start to break down and stick to the bottom of the pan – about 3-5 minutes. As they soften you can press them against the side of the pot with the back of your spoon to burst them – just be careful not to burn yourself with any hot liquid that squirts out from the tomatoes! Stir in fire roasted canned tomatoes and broth, scraping up any brown bits from the bottom of the pan and bring to a simmer. Simmer for about 20 minutes, until the tomatoes are very soft and the soup has reduced slightly. Reduce heat to low. Drain cashews and add to blender along with a little less than half of the soup. Never fill your blender more than halfway with hot liquid to avoid being scalded by hot soup! Hold a towel over the top of the blender (to catch any hot splatters) and blend cashews with soup on high until smooth and creamy and no pieces of cashews or vegetables remain. Transfer to a bowl or another pot and add the remaining soup to the blender. Pulse just a few times for a chunkier texture, or fully blend for a super smooth soup. Pour pulsed soup back into soup pot along with the soup blended with cashews and stir together. Season with 2-3 tablespoons of nutritional yeast (if using) and salt and pepper – how much salt will depend on the saltiness of your broth. Mine was a store bought chicken broth and I used about 2 1/2 teaspoons, but you can season to your own taste. Serve garnished with a drizzle of olive oil, a grind of black pepper, fresh basil and fennel fronds if desired. 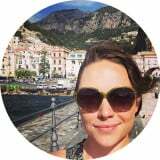 This entry was posted in soups and tagged dairy free, gluten free, paleo, summer, vegan, vegetarian on July 31, 2018 by Nyssa Tanner.